The Inrigo Camera Backpack was funded on Kickstarter late last year, and bags have begun shipping to backers. I had the chance to work with the bag, and here's a breakdown of what the Inrigo Camera Backpack has to offer. First, the bag is essentially a cross between a competent camera bag system and a marine dry bag. 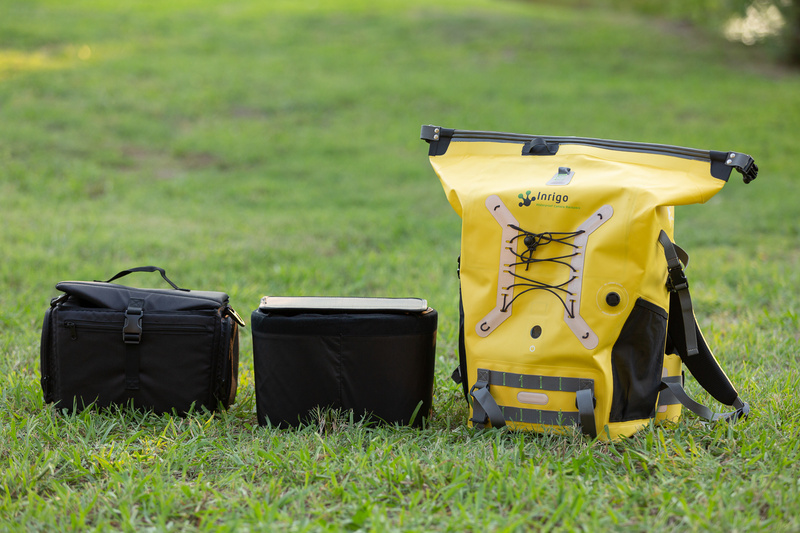 This high visibility camera bag system is for photographers doing work in environments where humidity, moisture, or direct contact with water are a cause for concern. In these environments, the bag shines and is a system that would benefit any photographer that is working on a beach, in on-and-off-again rain, or areas with very high humidity, while being able to monitor their gear for an abundance of moisture within the bag. You're able to monitor the humidity without ever having to open the bag itself, thereby preserving the kit from accidental contact with additional moisture and avoiding issues like mold growth. Lets get the obvious out of the way. Does the bag only come in bright yellow? The answer currently is yes, which may not appeal to everyone, but when using the bag as it’s intended to be used, the bright yellow makes sense. This is a camera bag made to be used by the water, and as we’ve seen many times, photographers, as well as their subjects, don’t always respect the power of the ocean and the possibility of a rogue wave interrupting a shoot. If your bag goes in the ocean, you’ll most likely be able to see it and hopefully rescue your kit before it’s gone for good. Inrigo has started looking at adding additional color options, but nothing has been cemented for release as of yet. The bag itself is well made, and after comparing the stitching to several Osprey packs (a proven and top-end bag company) that I primarily use for hiking and comparing to my Think Tank and Tamrac bags, I believe the Inrigo will hold up for years to come. The components of the bag have been stitched to thermoplastic polyurethane (TPU) patches, which then have been bonded to the bag itself, thereby allowing for a fully sealed bag that doesn't have weak spots due to silicon sealant or patching to re-waterproof the bag. The concept works well here, but does add some additional weight. The parts of any bag that wear out the quickest tend to be the contact points, where shoulder and hip harnesses attach to the bag itself. Inrigo has decided on a quick pin system that allows for these areas to receive much less wear and tear, all while adding an adjustment for varying sternum lengths. Most hiking bags are constructed for different sizes as they only have so much customization that can be done before a bag simply is not tall enough from hip to sternum and shoulder. I really appreciate that Inrigo went into this much detail to add that functionality to a bag. If you’ve ever hiked with a bag that didn’t fit correctly and had a decent amount of weight, you know the feeling of your shoulders in agony. I know my Think Tank and Tamrac bags do not have any customization options, and for kits that can be more than 20 pounds hiked with for several miles to some landscape shoots, it’s a pain. For a bag with even a modicum of torso length adjustment, this can mean the difference between shooting several days in a row in comfort or wanting to give up and not shoot anything at all. 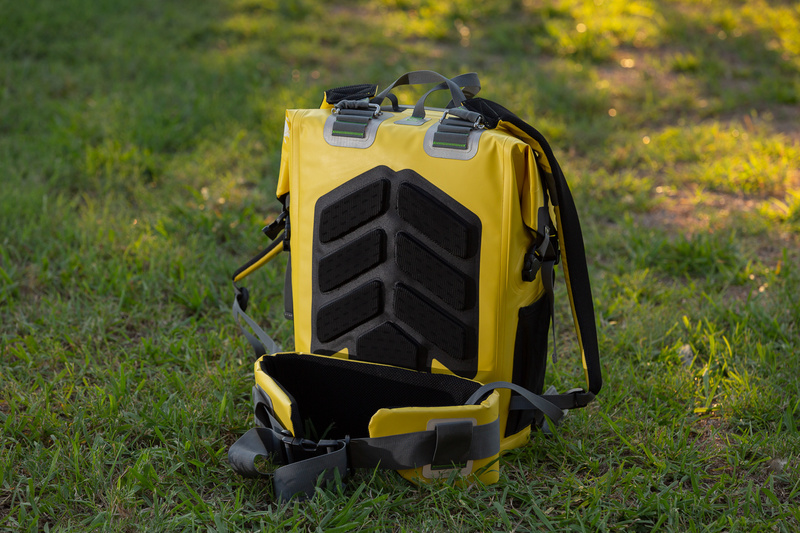 The bag is additionally outfitted with reflective TPU patches that double as load points for a drone on the back and the shoulder straps themselves, which will allow for seeing or locating the bag much easier, especially if you’re shooting towards evening time or at night. The bag will also accommodate two water bottles on either side, straps for holding a tripod on either the left or right hand side of the bag, and a dual strap for a tent or other cylindrical piece of kit up to 18 inches around on the back side of the bag. The padding for the shoulder straps and hip belt accommodates a loaded pack well, but I would have preferred a thicker and stiffer foam material that could add some rigidity to these areas, which would allow the pack to rely more on the hip belt for carrying weight much more evenly and allow the overall comfort level to be greater. The back padding on the pack is approximately a half inch thick and is vented to keep some of the heat and sweat off you back. This padding reaches below the hip area padding and adds a pressure point to the bag on the center of the spine. If you’re wearing the bag at an appropriate height, then this area fits perfectly in your lumbar area, and you will not feel pressure at all. If you’re keeping your straps longer than needed or are not using the hip belt, this pressure can be aggravating. Correctly fitting the Inrigo Camera Bag is invaluable in this regard. 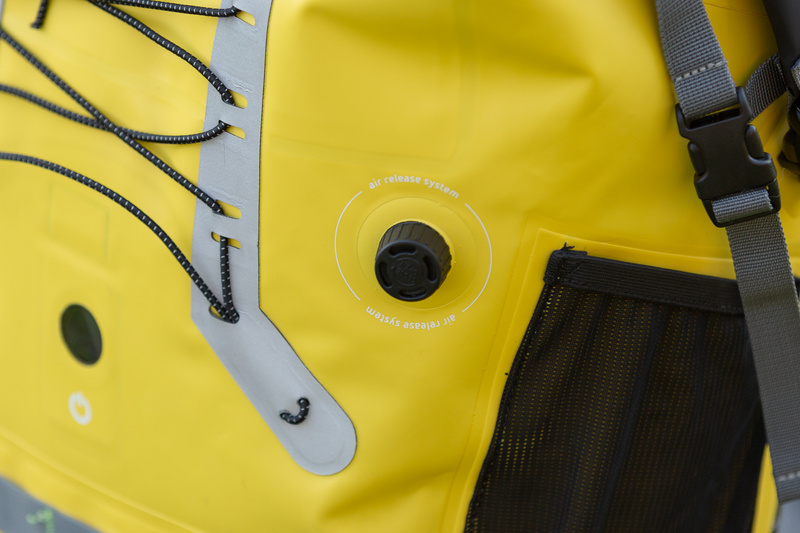 The closure of the bag is smart and differs from a dry bag, with interlacing rubber piping similar to a zip-lock bag. This makes accessing the contents of the bag quick and easy by just bringing the tabs together and the closure opening. Inrigo also supplies a silicone oil to apply to the closure so the rubber gasket closure works for years to come. I’ve used the same silicone oil on my Arai helmets where the gasket meets the visor, and the oil keeps the rubber from drying out in extreme heat or repeated drenching of water and drying. Be aware to keep debris out of this area, as with my initial outing with the bag, I used it in some gritty sand and did not take care to keep this area as clean as I should have. In subsequent testing, the bag maintained a leak in the corner of the lid opening when I intentionally submerged it for several minutes, though with simply soaking or floating the bag, it never leaked. After applying some silicone oil and redoing the testing several times, I finally found the rock that was stuck in the corner of the closure and removed it. Once the debris was removed, the bag did not leak any water at all. Don’t turn the bag upside-down in the sand and get dirt in the closure, especially in the corners. The bag also has an external screw vent that allows for equalizing pressure and humidity slowly within the enclosure. The number one reason for airtight seals to leak and fail is due to not being able to equalize pressure inside and outside of an enclosure. This goes to show that Inrigo have thought through not only the likely environments the bag will be used in, but have engineered a solution for the most probable failure point for an airtight bag. Before we dive inside the bag itself, let’s talk about the smart part of this kit. Within the bag and viewable through a transparent TPU plastic is the brains of the bag. The sensor is a small white box that has an LCD display that gives you the humidity, temperature, battery level, an alarm, and Bluetooth connection, all viewable through the transparent window on the rear of the bag. Inrigo has additionally created an app for iOS to interact with the sensor and to adjust settings for alarms to your phone in case the environment in the bag is becoming too humid, too hot, too cold, or if the bag is too far away. Inrigo Camera Backpack iOS app screen capture illustrating the humidity warning when set to 55 percent. If using the iOS app, you can also see the history of the humidity and temperature in the bag in 10-minute increments. This is great to know if you're working in a wet environment or opening and closing the bag and want to know if the environment in the bag has gone beyond your maximum levels, and if so, for how long. The longer a lens is in very humid environments, the more susceptible it can be to mold eventually growing within the lens itself. 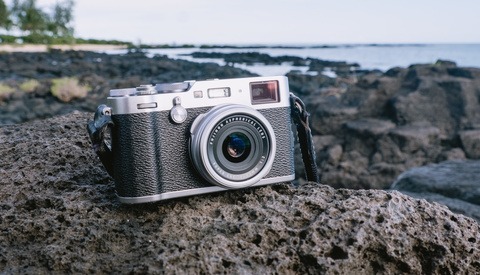 This is only exacerbated if your equipment is consistently being used in very humid or wet environments where the Inrigo Camera Bag has been created to be used. The sensor and the corresponding iOS app seemed to work well and were accurate when referenced to my home thermostat that displays current temperature and humidity levels. The only issue I had with the app is the proximity alarm not responding. I would travel 20-30 feet away from the bag until the Bluetooth would disconnect, and there was never any alarm that went off. It's possible that I didn't set the alarm correctly, but there're only three options for the proximity alarm in the settings. Finally diving inside the bag, lining the front and rear of the interior of the bag are two organizer pockets with multiple storage options. I was surprised by this additional interior storage and definitely appreciated having a quick place to store memory cards and chargers in an easy-to-reach place. The front (towards the padded back of the bag) is a plastic frame sheet mounted with two metal stays to create an internal frame for the bag. This aids the bag in maintaining its shape while allowing the hip belt to be used to hold the entire weight of the bag without shifting, which allows for the bag to hold more weight comfortably. Most camera bags today do not have any frame built in, which makes them less comfortable with heavier loads. 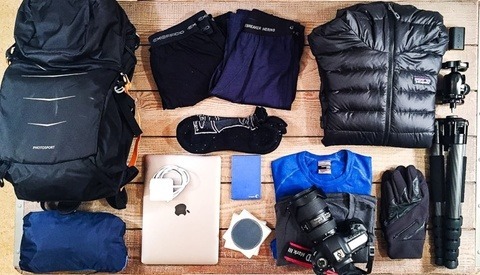 There are two compartments within the Inrigo Camera Backpack to carry your gear. While both compartments are removable, the top one is the only one I would regularly take out of the bag. Both top and bottom compartments are similar in size to a small camera bag that can easily hold a 24-70mm f/2.8 lens and a 70-200mm f/2.8 lens with a gripped full-frame camera body with enough room to throw in a speed light. Remember there are two of these compartments, so that’s four f/2.8 zooms, two gripped bodies, and two speed lights comfortably fitting within the padded compartments in the bag. The top compartment bag has a buckle top closure and a shoulder sling so you can grab and go with a smaller kit to take with you if you need to move away from the complete bag. There are also zipper compartments on three sides of the sling top bag for batteries and additional items. Within the bottom bag is a desiccant holder to lower humidity in the bag when the lid is closed. The desiccant and holder help to regulate the humidity in the bag and are the cornerstone of how the bag will maintain an environment that isn’t agreeable with mold growth and lower the moisture level in the bag, keeping your gear safe. The backpack is airtight and was able to remain submerged at a depth of 1 foot for 10 minutes without leaking. Monitoring the inner environment of the bag via the iOS app allows you to confirm moisture levels without opening the pack. A proper internal frame on a camera backpack! 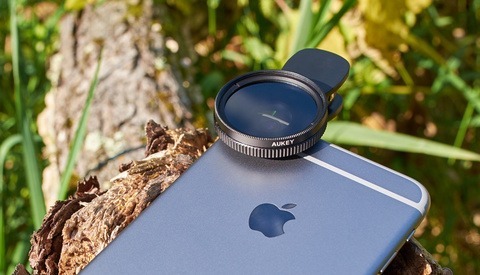 This should be on every camera backpack that is expected to hold even a modicum of gear. Stitching on the seams and the TPU bonding on the pack look to be well made and should hold up to aggressive use. 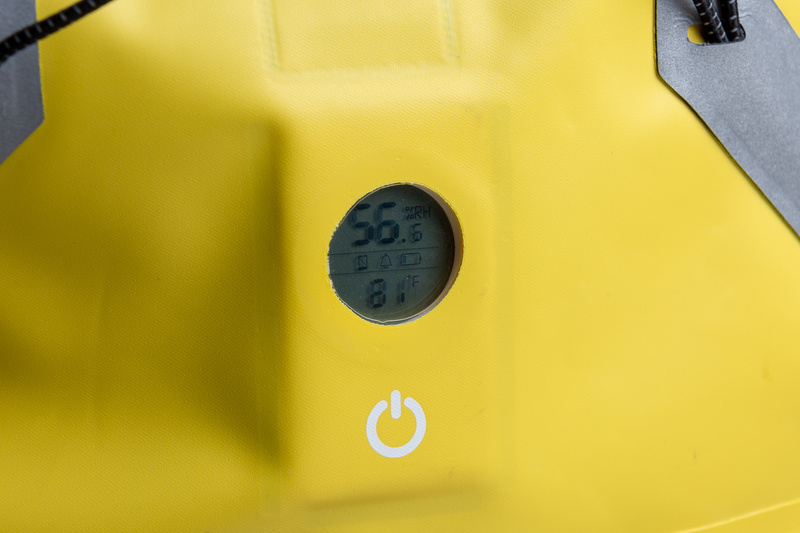 A vent to equalize pressure and humidity levels slowly, which reduces the most likely failure of an airtight pack. Reflectors on the outside of the backpack to locate it in early evening or at night. Space for gear inside is large and robust with an easy-to-remove mini sling bag. Multiple points to attach additional gear to outside of the pack. Easy to open and close top closure. A large container of desiccant is included with the bag. The yellow color makes sense, but I would prefer a darker color scheme. Most people don't hike and are not used to a top closure bag and will find undoing the lid to get to their gear a time-consuming process. I'm used to roll-top dry bags and prefer them for watertight closures. The shoulder straps and hip belt could be made with a more rigid foam material and would be even better for weight and/or long hikes. 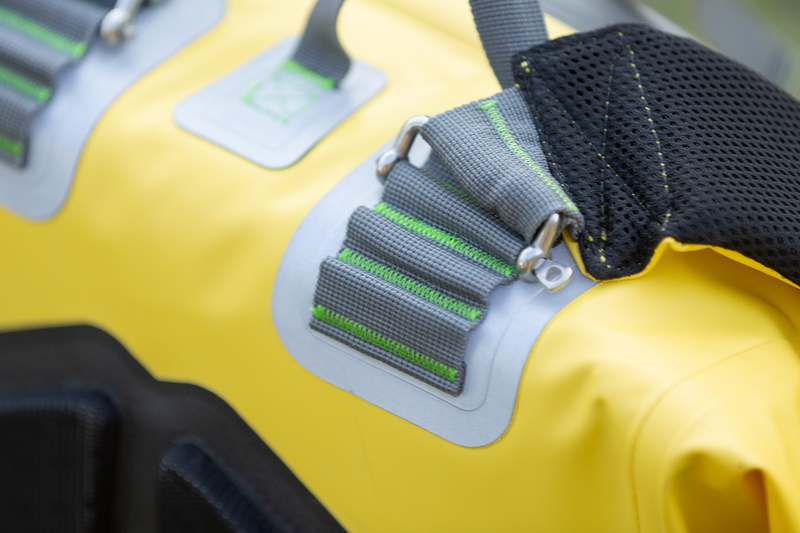 There's no reason to use TPU for the hip belt and shoulder areas, and this decreases breathability of the places where you'll sweat the most when using the bag. I would prefer the interior mini sling bag to zip close rather than buckle. I couldn't get the proximity alert/alarm to signal via the iOS app. The Inrigo Camera Backpack overall is a fantastic contribution to the large assortment of camera bags available on the market today. 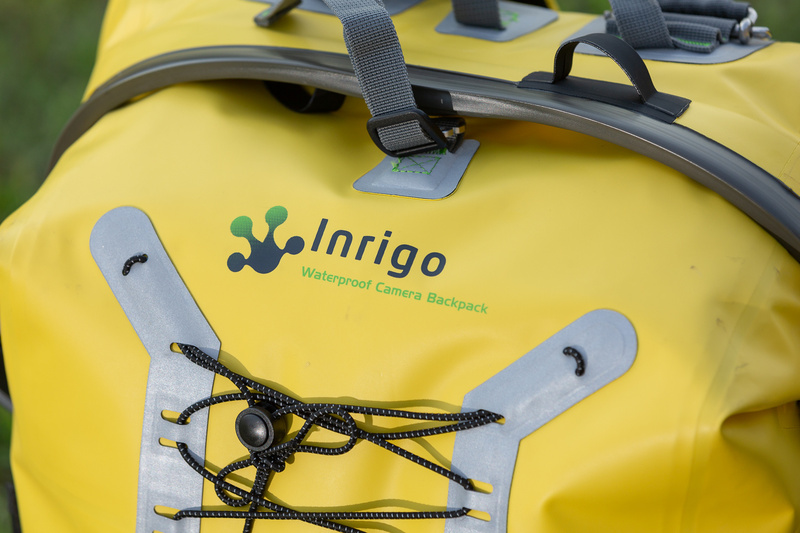 With the list of real-world features that relate well with keeping your gear in top shape by maintaining a dry environment in the bag, the Inrigo Camera Bag would be valuable to anyone working near water or in wet environments consistently. The internal frame and padded hip belt will help in keeping your back and shoulders from baring the brunt of the weight of your gear and moving that weight to the area of the body that absorbs and balances it easiest: your hips via that padded hip belt. 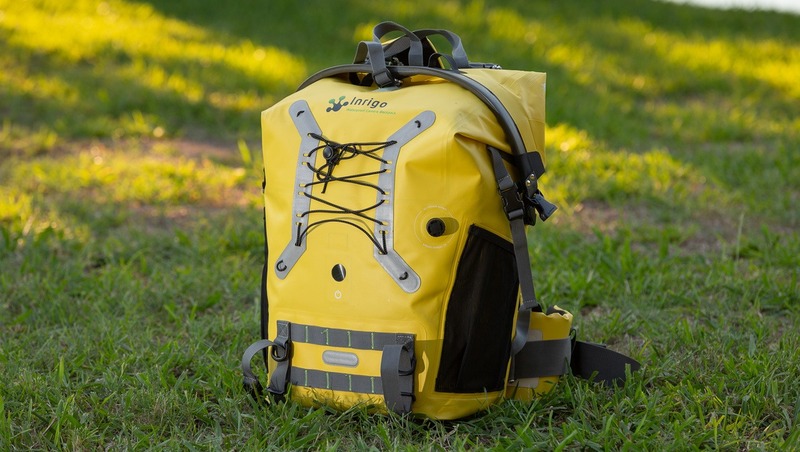 If you’re looking for a dedicated camera bag that's also a dry bag and a bit of a hiking pack, I recommend taking a look at the Inrigo Camera Backpack.